Yes, polar bears eat walruses but they don’t feed on adult walruses for they are too big to fall prey to polar bears. 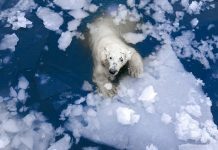 Polar bears are the supreme predators of the Arctic—they are the lord of the Arctic. 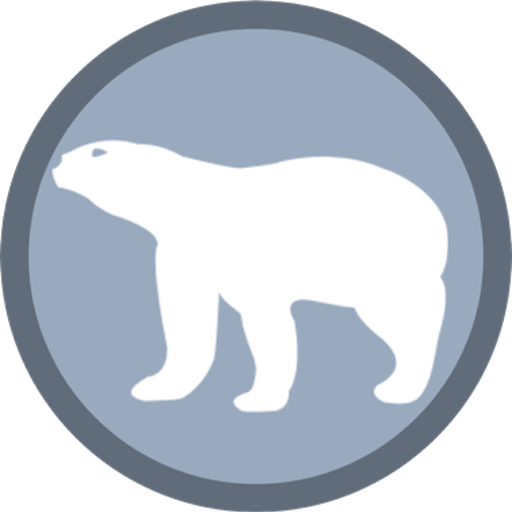 However, there are a few Arctic mammals that are way too big as compared to polar bears. Walrus is one of them, in fact it is the heaviest mammal of all Arctic mammals. Let us see how do polar bears eat walruses in the wild. Do Polar Bears Eat Walruses? Walruses are definitely one of the polar bear’s preys but they are equally dangerous too. 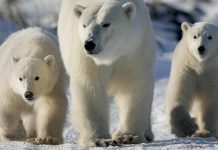 For that reason, polar bears are less likely to hunt walruses and only male polar bears can take the risk of predating walruses. Walruses are huge, they are massive in size. The female walrus which is only half the size of a male, weighs no less than 1,870 pounds. 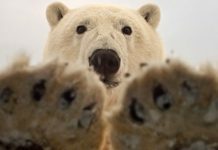 The adult male polar bear weighs only 800 pounds—half the weight of an adult female walrus. Adult male walrus averages 3,740 pounds which is 4 to 5 times the weight of an adult male polar bear. That indeed makes adult walruses almost immune to polar bear predation. Walruses are not only safe by virtue of their mammoth size, they have strong defense too. All walruses, let alone adult males, have tusks. Males have greater tusks than females. However, they don’t really use it against polar bears. The walrus’ tusks typically serve as sledge to feed on bottom dwelling species. The range of walruses and polar bears often overlaps in Baffin Bay, Foxe Basin, Barents, Chukchi, Laptev, Lancaster Sound, Kara, western Beaufort Seas, and Bering Seas. Walruses are shallow divers and they are protected by a 2 – 4 cm thick skin. Therefore, only the largest polar bear can afford to take on adult walruses but that too happens in extreme circumstances. Generally polar bears are most likely to feed on walrus’ calves. Walruses usually congregate in large groups consisting of thousands of individuals. 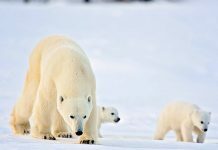 It is not easy for a polar bear to hunt a walrus’ calf that lies among the largest walruses. And so, polar bear sometimes stampedes a large herd and by so doing, they can get a chance to grab a calf. 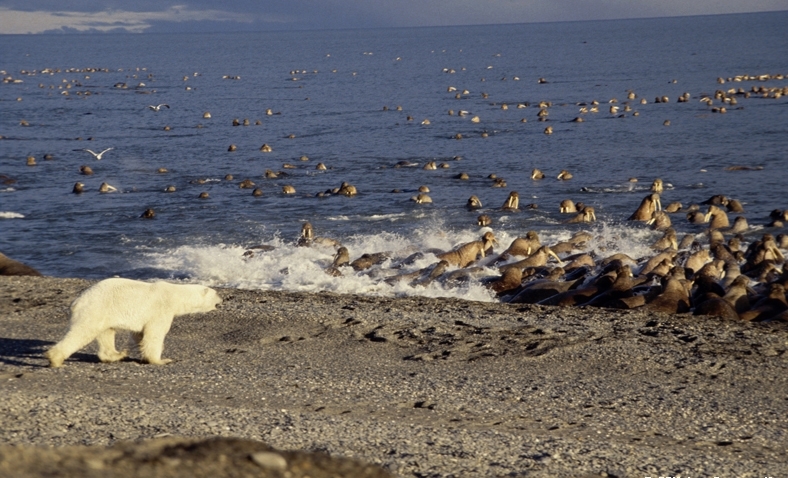 The large herd runs towards the sea as the polar bear intrudes them. On their way they sometimes kill their own calves which indeed become the polar bear’s meal. Walruses on land are thought to be rather more vulnerable to polar bears as compared to those that occur in water or on ice. The reason why they are so susceptible on land is that walrus, unlike polar bears, are not really agile on land. Many polar bear populations are unable to prey on walrus for they live far apart. However those that live near walrus population likely prey on walrus but only adult male bears do the hunting. Studies suggest that male polar bears attempt about 60% of attacks on walrus, while females attempt only 17%. The subadult bears attempt the remaining 23% of the attacks but most, if not all, of their hunts ends up in waste. 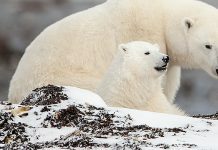 Scientists estimate that on Wrangel Island, about 6% of polar bear’s predation ends up in success. The walrus’ calves turn out to be the most common target. Why Do Polar Bears Eat Walruses? Now, you would probably be wondering as to why polar bears eat walruses when they know it’s a dangerous meal. They will hunt walrus only as a last resort. That is to say that when polar bear’s primary prey becomes scarce, they go after the walrus. 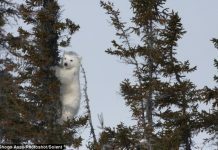 It so happens that sometimes the polar bear starves for months and thus it becomes so desperate that it doesn’t afraid to take more chances. Walrus’ meal is particularly dangerous because it can sometimes cause serious injuries to a polar bear. The meal is heavy and so is the price. The bottom line is that the polar bears must have been much larger than they actually are, in order to hunt walruses pretty safely.